Team GB's gold rush continued on day 13 of the Rio Olympics with victory in the triathlon, taekwondo and sailing. Alistair Brownlee and brother Jonny stormed the triathlon, as Alistair defended his title from London 2012 with his younger sibling taking silver - an improvement on bronze four years earlier. Jade Jones also retained her title after winning the 57kg taekwondo final, while Hannah Mills and Saskia Clark took gold in the women's sailing. Thursday's success takes Team GB's medal haul to 22 gold, 21 silver and 13 bronze - making 55 in total. This summer's Games are the most successful away Games for Team GB in history. 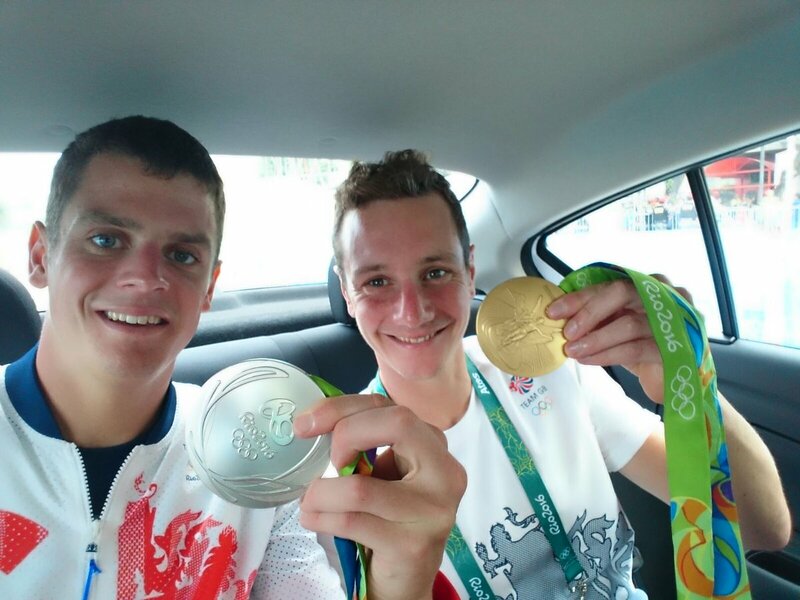 Alistair Brownlee became the first man to defend the Olympic triathlon title after he saw off the challenge of his brother Jonny to win Team GB's 20th gold medal of Rio 2016. The London 2012 stars from Yorkshire became the dominant performers on the roads along the Copacabana after finishing the opening swim among the leaders. Both brothers remained close on the middle bike leg but 28-year-old Alistair moved away from 26-year-old Jonny in the closing running section of the race. The champion celebrated by walking towards the victory line, allowing his brother to almost catch up, before the pair fell to the ground and embraced. Afterwards, the brothers described their achievements as "magical". Defending Olympic Taekwondo champion Jade Jones retained her gold medal late on Thursday. The 23-year-old from Wales beat Spaniard Eva Calvo Gomez 16-7 in the final of the 57kg category. Jones looked elated as she sealed the gold medal, four years on from winning her first Olympic gold at London 2012. "It still doesn't feel real that I won in London so to have done it again is just crazy. I'm so proud of myself because I didn't realise how much pressure I would feel coming into these Games," she said. Sailors Hannah Mills and Saskia Clark won the gold medal in the women's 470 class. Four years on from taking silver, the duo arrived in Brazil determined to go one better. Mills and Clark produced an opening series as impressive as it was consistent to see them head into the women's 470 medal race all but assured of gold. The British duo merely had to complete the double-point medal race without disqualification and duly did so, easing home in eighth in the delayed finale to rubber-stamp glory. Elsewhere, there were more medals for Team GB. Liam Heath and Jon Schofield won silver in the men's kayak double 200m final. Meanwhile, Marcus Ellis and Chris Langridge won the country's first Olympic badminton men's doubles medal, beating China's Hong Wei and Chai Biao to take bronze. Britain remains ahead of China in the medals table on second, but 13 golds behind the USA in first position.